bistro steakhouse-style breakfast and lunch with a classic fine dining experience for dinner. Between 5:00pm-7:00pm come to the bar and enjoy $1 oysters Monday thru Friday. Also, featuring our three course prix fixe dinner at the bar only between 5:00pm-7:00pm for $40. The Federal welcomes you to celebrate Mother's Day with us. We will feature our traditional bistro and steakhouse menu, as well as a few seasonal treats. Moms will receive a small gift, in a gift box, from the restaurant of petit fours and mignardises. 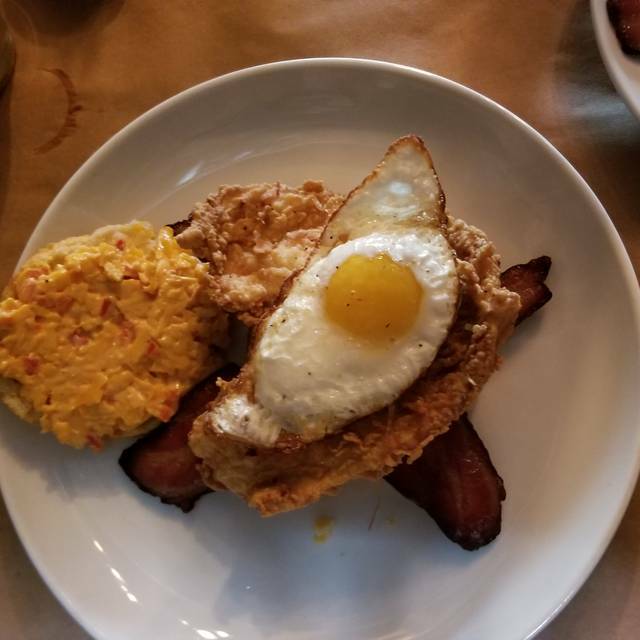 Celebrate in style at The Federal featuring our traditional brunch favorites and an Easter inspired prix fixe menu. The dining area was quaint and illuminated with candle lights, giving it a cozy feel. Upon entering the restaurant you see the different cuts of meat they have to offer. The noise level was loud, but after half a Manhattan you settled in and it became great dining area. The server, Michael, was very friendly and accommodating. They did run out of several sides but Michael offered some dipping sauces for our steak, for the inconvenience. The thick cut bacon was a great start to our meal which was followed by the special of the night, 36oz tomahawk ribeye. We finished the meal off with their bread pudding and a cup of coffee. Pretty good. Just terrible execution. Food was average (ribeye- excellent- all else pedestrian). Wine list is incredibly weak. Service was less than non-attentive. Fire alarm went of during dinner due to kitchen fire (there was zero communication as to things under control or we should run for our lives). Honestly, just a mess. So many other great food options nearby. Waiter was always in a hurry and could not be bothered to wait for our choices. Food was overpriced. Got quoted the wrong price on a special item. Very frustrating experience all round. I was so incredibly disappointed in my crab cake it was all breadcrumbs. My salad was bitter and it was not because of the vinaigrette which was actually good. Overall it is too expensive for lunch and the wait for food is too long. Food was delicious and we received great service. The bacon was awesome! We will definitely come back! We had a fantastic experience! The steak was the best Atlanta had to offer, cocktails were perfectly crafted, and service was attentive and punctual. Thank you! We sat at the bar and while the restaurant had a handful of there patrons, it was not full or super busy. The bartender wasn't unfriendly, just more disinterested. We had to get his attention to order drinks, food and ask for water - as opposed to him checking on us or asking us if we needed anything. The food was okay. I had the pork schnitzel and it was a bit dry. 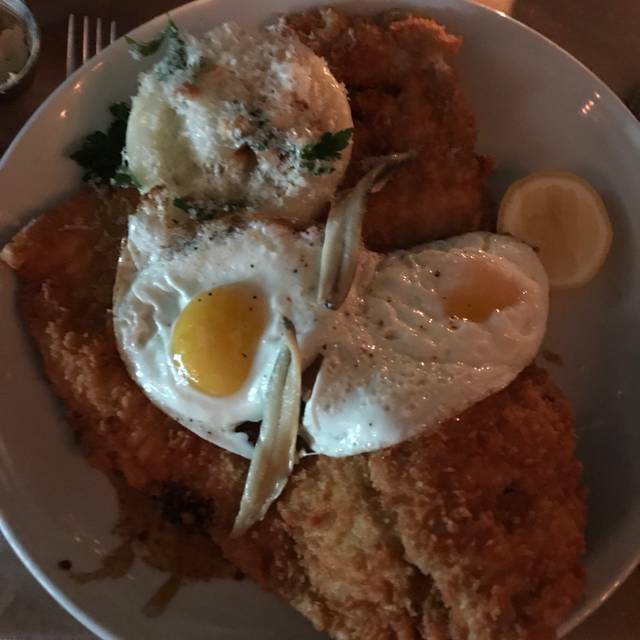 The large, thick cut onions that sat on top of the schnitzel were nearly raw and not good. I love onions. The salad and crab cake my friend ordered were good, as were the oysters and fries we had to start. Overall, I was disappointed in the service and my meal but it could have just been an off night! It’s my third time going to this restaurant, but the last time probably was a year ago. Anyways the server Ethan was not polite with us. Was always like in a rush don’t took the time to explain carefully about the options. I order the burger he said that is not available anymore so I did need some time to look the menu. We order drinks and when he bring to us he drop on the table my wife drink, did no say anything to apologize or clean the table. My steak I ordered medium well came well done. After we finish my wife and I were talking trying to have at least a good conversation but he just Put the check on the table and we didn’t say that we’re about to leave. Not a good experience at this time service wasn’t good and my food was not the way I ordered. Ribeye and wine selection were perfection! Service was amazing. Good place to eat but pricey. I like the Paul Hobbs Cabernet and fillet. Previously, we had a closing dinner at The Federal with a table for six and it was a great experience. The charcuterie board has a lovely selection for the price. The quantity is great as well! DO NOT MISS the bacon appetizer with the chimichurri. Seriously some of the best I’ve ever had. The Peachtree battle cocktail was perfectly sweet while still boozy. I loved the restaurant and the server was awesome. We thought the food was over priced. We eat out a ton and felt like the prices were way too high for what you get. Really tasty steakhouse fare, but in a spot that doesn't smack of "steakhouse chain". Great service and an awesome bar. Unfortunately all four steaks were over cooked and under seasoned. 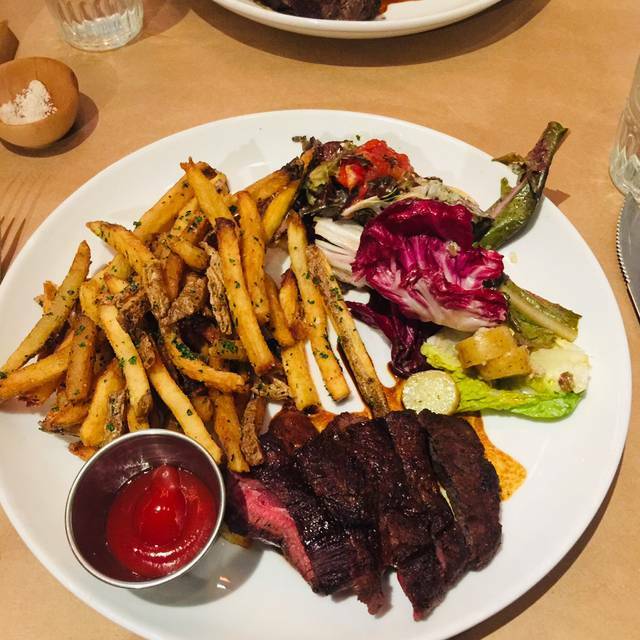 For a $58 steak frites, this is not good. A Brussels sprout Caesar salad was underdressed, to the point I’m not sure the dressing was included. The charcuterie board was fine. Overall, very high prices for poor execution. Amazing service, but our waitress did a pretty good job at upselling. We would have been fine with just one large cut of meat, but we got scarred into ordering several. Great food though and upbeat and trendy atmosphere. Would come back and also recommend. 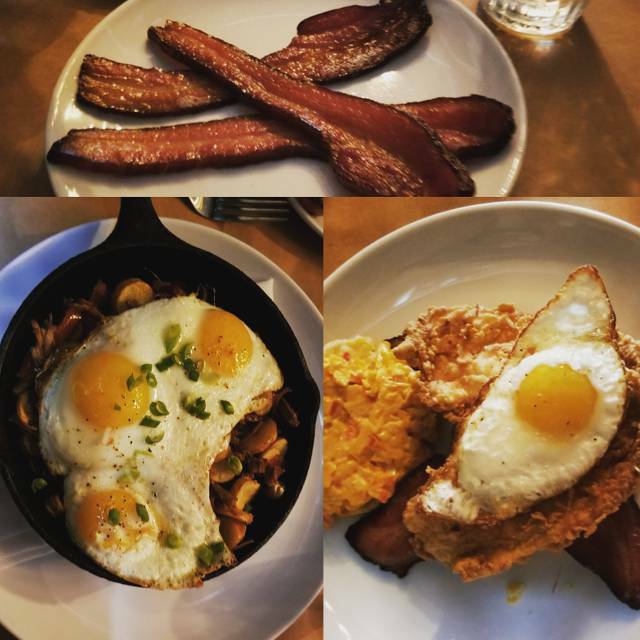 My boyfriend and I found the Federal to be the perfect restaurant for date night. 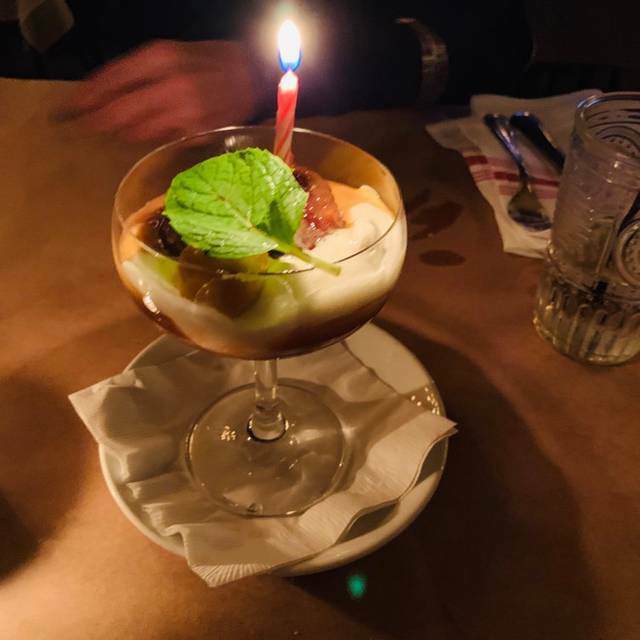 We loved the atmosphere, the food, and the fantastic service. Our waiter was polite, prompt, and funny, adding the icing on the cake to an already great experience. On top of our appetizers and bread service, the portions were huge, leaving no room for dessert. Service was great (waiter) Cook had to put my steak on the girl 3 times, even after I originally stated well done no pink. My fiancé enjoyed her food, although her crab cake had pieces of shell in it. I would expect precision and execution from a restaurant of this caliber. It seemed like the restaurant was more concerned with processing orders than make in sure customers were satisfied. Wonderful Chicken Livers and Oxtail soup. Plenty of great food options. Waiter was very Gliebe. Bartender never engaging with customer even when prompted. Food. Need to learn other to cook a filet Pittsburgh rare on cast iron. Waiter and bartender actions could have been corrected with 20 seconds of being genuine. $250+ for dinner for two. We could have gone to Bones. 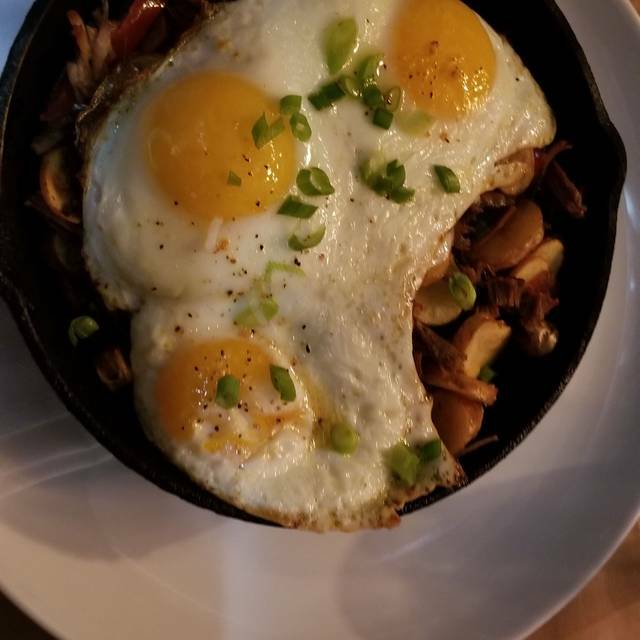 I took my girlfriend to the Federal in the hopes of having a wonderful dining experience for Valentine's Day. I made reservations for 7pm, and we arrived around 6:40. We were informed that our table was not ready and to come back to the host stand around 7. We were seated around 7:15 and probably waited another 10-15 minutes before our server even took our drink orders. We ordered the French Onion Oxtail soup for an appetizer and it was fantastic. We then ordered our entrees, my date ordered the Swordfish and I had the lamb chop. Both were great. However, right after we ordered our entrees, our waitress asked if she could have our menus because they did not have any more for the other guests. We kindly obliged. Without menus, we asked our waitress for wine recommendations to pair with each of our meals. After a wonderful dessert, we got the bill and we noticed that the wine that was served to us was literally the most expensive wine on the menu. To top it off, when we asked for our meal/leftovers to be boxed up, the bread was just thrown in the bag without having been wrapped up with so much as a paper towel. So considering that we were gouged and didn't have our food boxed up properly, I would say that the overall experience was poor. Probably wouldn't recommend to a friend...its VERY LOUD in there. It was very difficult to understand my date while we talked...noise levels are very high there, In my opinion. The service was very good however, it was very busy and the waiter was still very attentive and pleasant. We went after a visit to the High, about 9pm. Parking was easy next door. 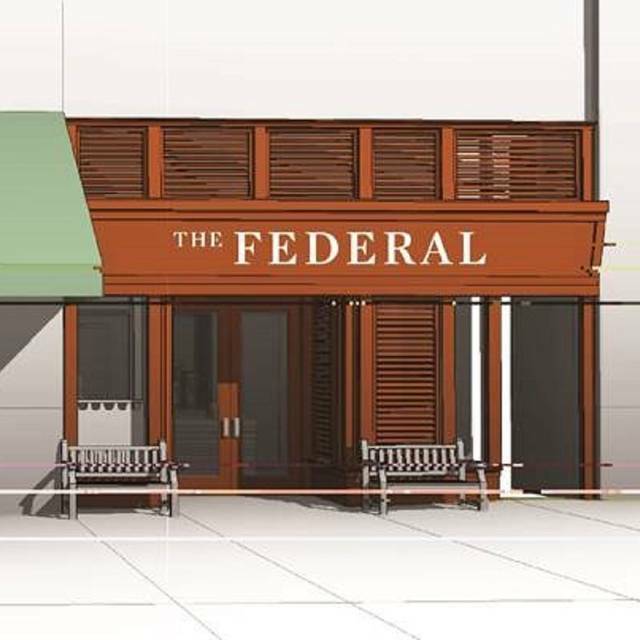 The Federal has a bistro feel, and the wait staff were jovial and on top of things. We had the smoked fish appetizer with salads and the onion soup was superb. We will come back. THere is virtually nothing on the menu for a non meat eater, one swardfish dish, that's all. The entree's were exorbitantly priced. The simple steak frittes my wife ordered was $58!! I had an exceptional meal at Atlas last night, substantially better and more interesting, and the entree prices ranged from $32-$45. The corkage was also outrageous, at $25 per bottle. That is very high for this level restaurant. I even gave the manager and chef about 1/4 bottle of a 1999 Grand Cru Burgundy, just to be generous. All in all, it was one of the worst restaurant experiences I have had in a while, and we eat out often. The Federal is walking distance from our house, but I will not waste the steps again for this one. We visited The Federal for our Valentine's dinner. The setting was very romantic. Low light and candle lit. The music was perfect. Our server was very knowledgeable and friendly. We had the flatbread to start for a light snack with Cava. Then we enjoyed the Oxtail French Onion Soup. It was the best we've ever had. 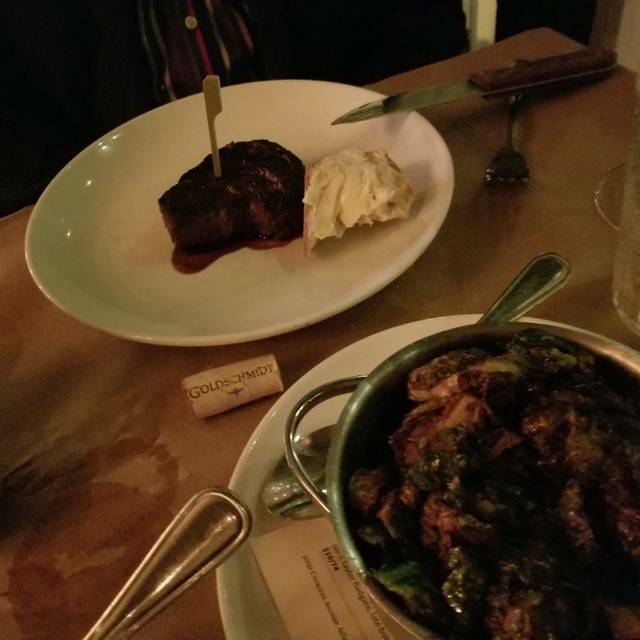 A delicious brussels sprout salad and we shared the Ribeye. It was cooked to perfection. With a great bottle of Zin and a Kit Kat for dessert, we were happier than can be. I highly recommend The Federal the next time you're in the mood for a steak or have plans Downtown. Food was very good. Perfectly prepared as ordered. Server was attentive without being intrusive. Free parking is a plus at a downtown restaurant. We thought the food was a bit more expensive than it should have been so the value was not terrific. The room was nice but got noisy as the evening went on. Wines by the glass were somewhat expensive. The rack of lamb was tasty but small for the price. The pork schnitzel was excellent. Very good restaurant for special occasions. Excellent service. Excellent steak and crab Louis salad (on special that night). Food and service were very good. Music was 1940s love songs at a comically loud volume level. We couldn't wait to get out of there. Won't go back. Hi, Thank you for your review. We do apologize for your experience concerning our music program. We have an extensive collection of records and we do take request. So, please next time you dine in make a request or feel free to bring in your own album! Good food. Poor service. Had to walk to bar to ask for water and our 2nd glass of wine which was ordered from server who was just hanging out at the bar. One guest meal came out 15 min after 1st meal. Note: not crowded only 2 other tables in restaurant. I had looked this place up since I needed to have a business lunch with clients and The Federal would fit the bill. It was loud. The music was loud, but I did ask the waitron to lower and she did. Granted, we were the 1st ones there for lunch so the acoustics were sub-par. Then when partrons came in and filled the space, it was still a bid noisy. The food was awesome! 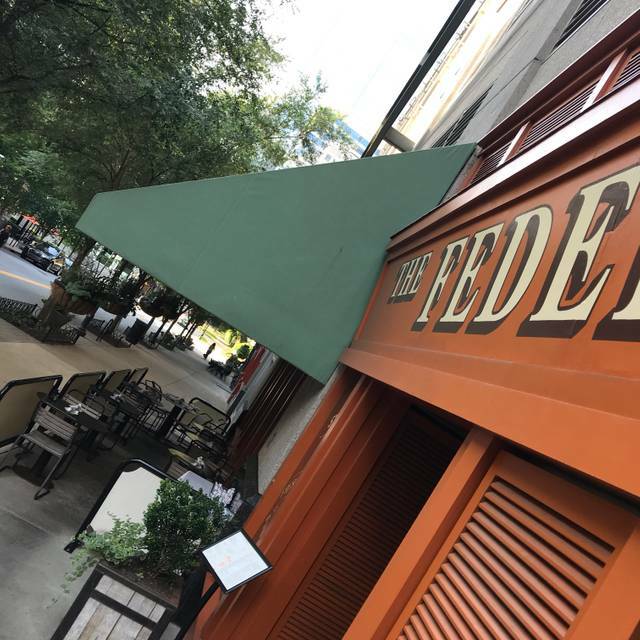 I stop in to The Federal every time I visit Atlanta. I can always count on a consistently good meal and a great bourbon selection! Wonderful dinner, will go back! Food was fabulous. Atmosphere is dark and intimate, and we feels like you are in Europe.